While the gubernatorial candidates say they plan to stick to the issues as the party's convention kicks off in Lewiston, the three men vying to replace Republican U.S. Rep. Bruce Poliquin waste no time in going on the offensive. LEWISTON — Maine Democrats eager to move past the era of Republican Gov. Paul LePage say that trashing him is not the way to win an election. 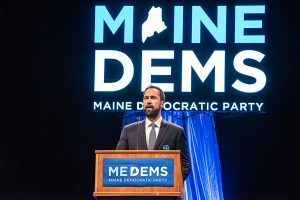 So when the Maine Democratic State Convention began Friday night at The Colisee, gubernatorial candidates like Diane Russell arrived with a plan of sticking to issues, such as affordable college education and universal access to health care. She said focusing on the term-limited LePage is “a recipe for disaster” for Democrats. Democrats will try to sort through a crowded field to replace LePage, who has feuded with liberals in the state since his election in 2010. They also are putting a premium on winning back the state Senate and 2nd Congressional District seat held by Republican Bruce Poliquin, with the three candidates to replace him wasting no time in going on the offensive. 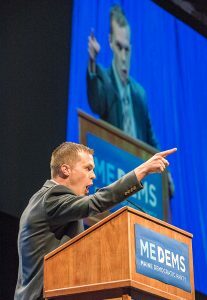 State Democratic Party Chairman Phil Bartlett said this year’s convention is about “offering a forward-looking message.” He expects candidates and party members to focus on issues that include income inequality, job growth and the state’s opioid epidemic. Gubernatorial candidate Betsy Sweet, a former director of the Maine Women’s Lobby, called the election “a pivotal moment in our history, not just as a party but as a state.” She said Democrats need to focus on environmental protection, a living wage and affordable health care. “We have a moment to do things really differently. Put LePage in the rearview mirror and see what we can do going forward,” she said. There are seven Democratic gubernatorial candidates on the June 12 primary ballot, and voters will use a ranked-choice voting system for the first time in the state’s history. 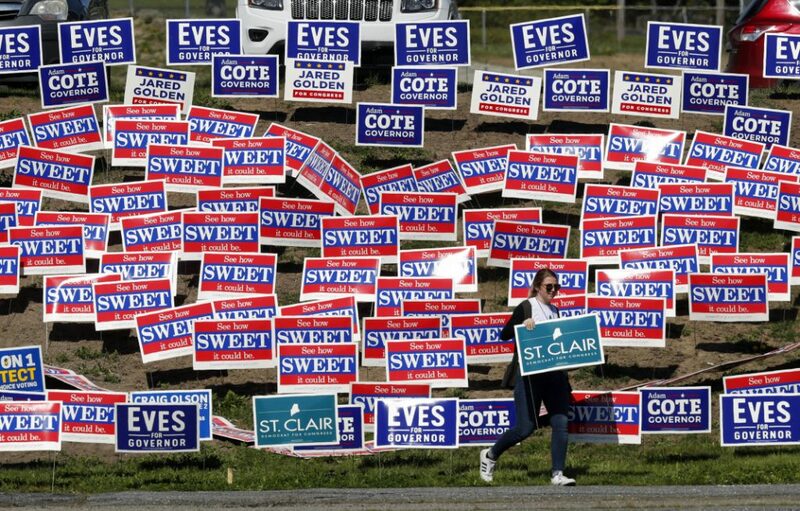 Other Democratic gubernatorial candidates are Attorney General Janet Mills, attorney Adam Cote, state Sen. Mark Dion, former Biddeford Mayor Donna Dion and former state Speaker of the House of Representatives Mark Eves. The convention runs through Sunday. Republicans held their convention earlier this month in Augusta. Republican voters will choose between House Minority Leader Kenneth Fredette, state Sen. Garrett Mason, former Maine Health and Human Services Commissioner Mary Mayhew and businessman Shawn Moody. Democratic Rep. Chellie Pingree, who is up for re-election against Republican Mark Holbrook and independent state Rep. Marty Grohman, said her party’s convention will be “busy and big.” It’s critical for Democrats to take advantage of an electorate that could be in a mood for change, she said. She cited successes Democrats have had in special elections since the election of President Trump, such as Doug Jones’ victory in a U.S. Senate in Alabama last year. The first day of the convention focused partly on the congressional races, with Pingree and others speaking to a crowd of more than 2,000. The three 2nd Congressional District candidates also spoke, and wasted no time in ripping into Poliquin’s record and character, riling the crowd and drawing cheers. Jared Golden portrayed Poliquin as a political coward who hides in bathrooms to avoid hard questions. Craig Olson declared that the time has come for the Republican congressman to be replaced with a Democrat before he can do more damage. Lucas St. Clair described Poliquin as a man who lacks compassion and who is friend only to wealthy corporations and big donors. Golden, a former U.S. Marine, echoed those themes. Olson, a former dairy farmer, sounded the note of party unity. Saturday is mostly dedicated to candidates for governor. 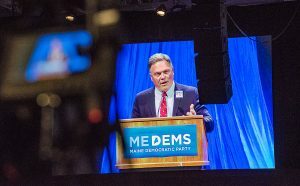 Cote said the convention and the governor’s race would be about “being able to excite and energize the Democratic Party in Maine.” That means talking about working-class issues, not bashing the governor, he said. Sun Journal Staff Writer Mark LaFlamme contributed to this report.